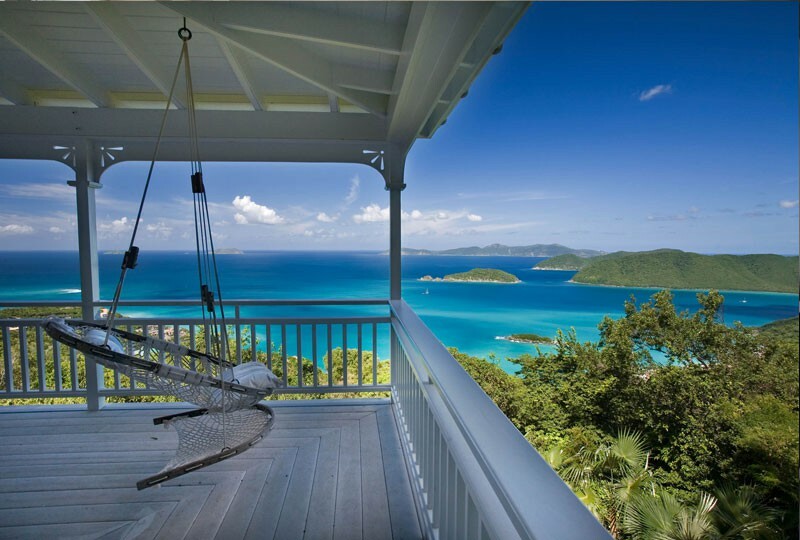 ESCAPE THE WINTER’S COLD AND VISIT WARM & BEAUTIFUL ST JOHN!! 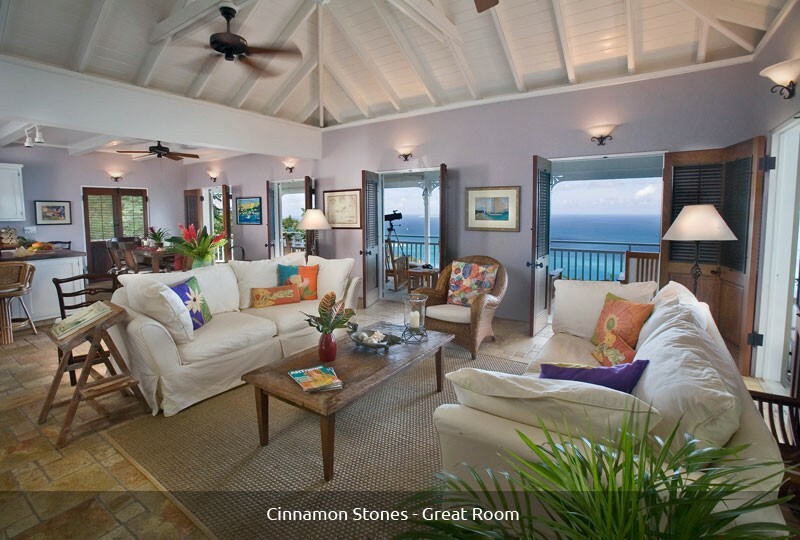 Cinnamon Stones sits high on the hillside of Estate Catherineberg, a small prestigious community of luxury villas, surrounded by the Virgin Islands National Park. 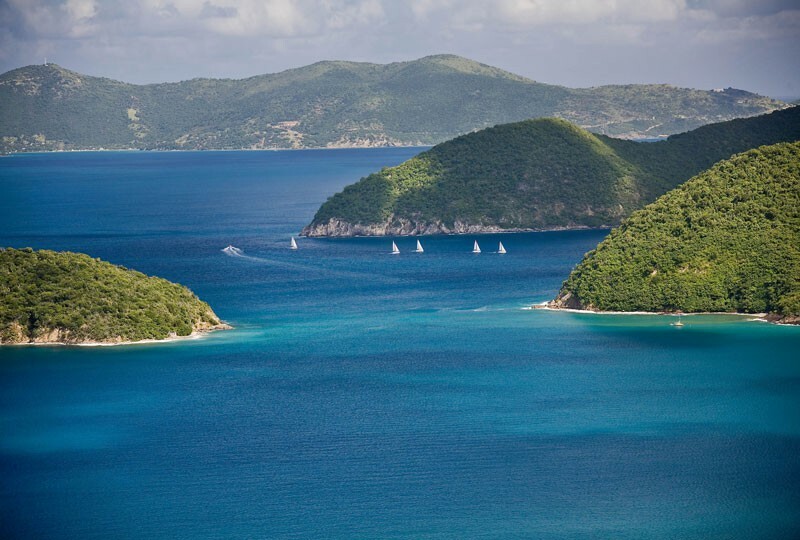 Overlooking Cinnamon Bay, Peter Bay, Francis Bay and Johnson’s Reef, you can see from Hans Lollick and Lovango in the west, north to Jost Van Dyke and east to Tortola. It is a big, breathtaking view. The house is on one acre of beautifully landscaped land. The steep hillside is covered with old stones and a very special thirty foot high rock outcrop. The colors of the stone were an inspiration for the interior of the house. The house was designed by St. John architect and artist Carolyn Caldwell, and constructed in 1999 by her husband, Ken Betts. 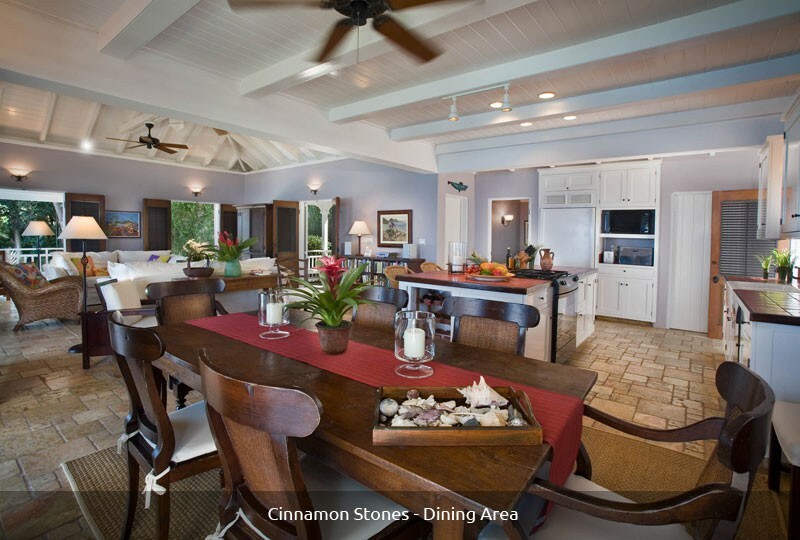 It takes advantage of all the best features of Caribbean homes: thick concrete walls, an abundance of louvered doors on all sides, ceiling fans and cool stone floors. Skill and craftsmanship are evident throughout this very special house. 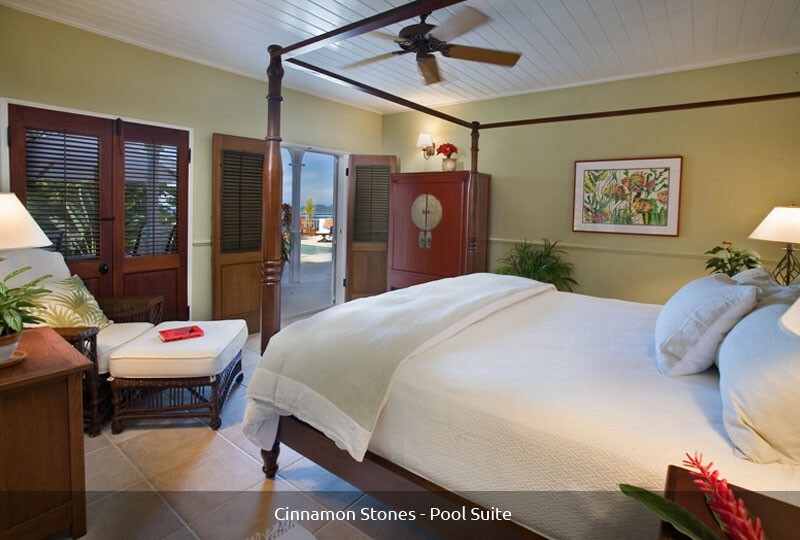 At Cinnamon Stones you are surrounded by the beauty of the woods and the sea. 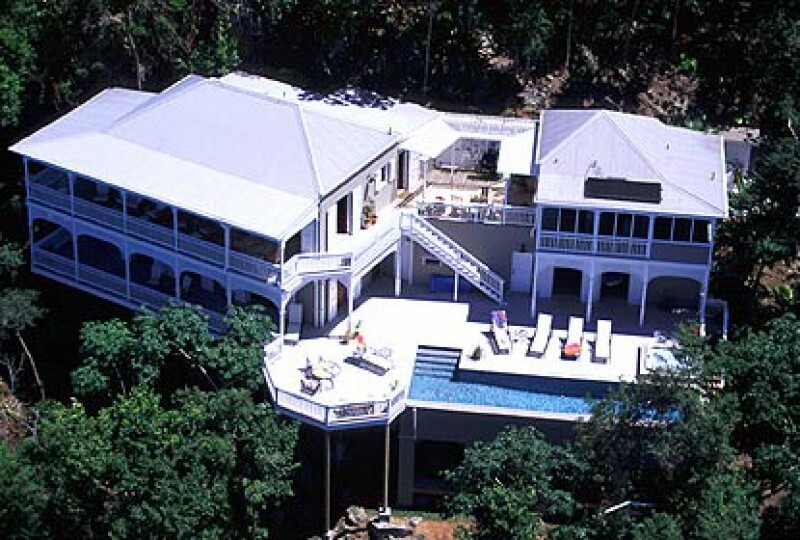 The house is a tribute to architectural restraint and a sensitivity to Caribbean style. It is place to love and to return again and again. The Great Room is painted a cool gray lavender, the color of the British Virgin Islands and the sea at dawn and dusk, which you see through six louvered mahogany French doors. 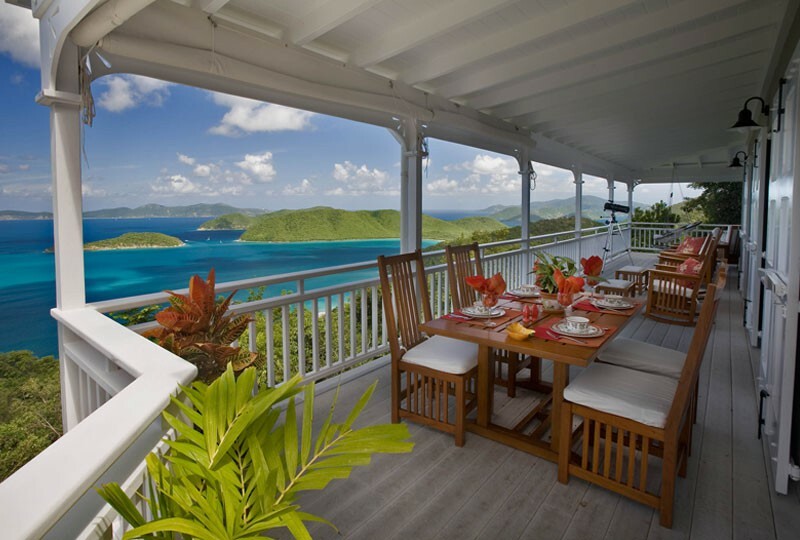 All the mahogany doors and windows were handcrafted on St. John. The floor is imported Italian limestone. There is a vaulted kingpost ceiling over the sitting area which has two very comfy sofas, perfect for watching a movie. The custom built mahogany entertainment center has a 40” LCD TV with Expanded Digital Cable, VCR, Blue Ray DVD Player and Echo Dot. Also included is a large video and DVD library Or you may prefer choosing something to read from a collection of over 100 books of contemporary fiction – many award winners and best sellers of the past ten years. A selection of board games and cards are available under the kitchen island as well as large array of table linens for a special dinner inside or out on the veranda. Original paintings by well known St. John artists hang throughout the house. Off the Great Room is a small office with desk, MFC printer and scanner capabilities, wireless DSL and more books. A guest bath is adjacent. The interior dining area has a large antique teak table which can easily seat eight. The table settings include dinnerware by Villeroy and Bock, stainless flatware by Gorham. There is an abundance of serving pieces, platters, bowls and trays. A wine rack is built into the adjacent counter. The kitchen is designed for serious cooking with all new appliances included a gas stove, refrigerator/freezer with water and ice dispenser, and dishwasher. The white custom made cupboards with red hand glazed tile counter tops are filled with all the important and not so important kitchen equipment from Williams-Sonoma. Off the kitchen is a pantry for storage of large pots, pans, and picnic equipment. 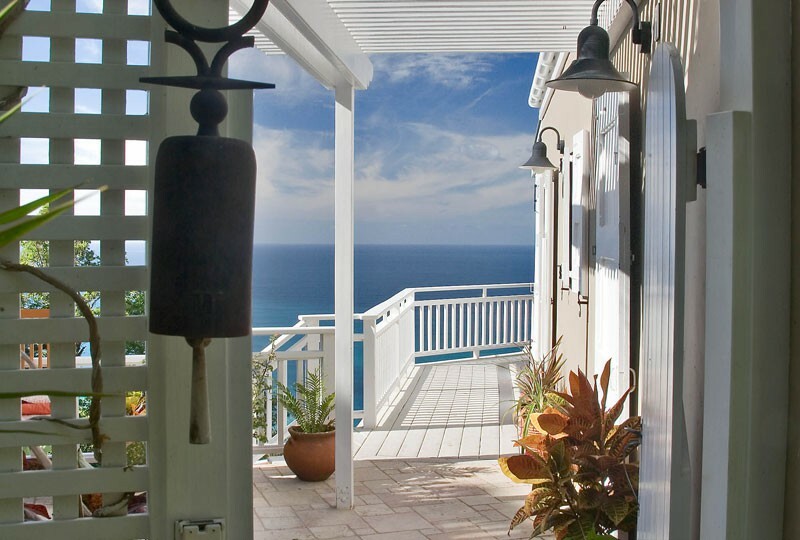 Every door in the Great Room opens to the gracious verandah and the glorious blue sea. The comfortable teak furniture on the verandah includes rockers, big arm chairs, a love seat and a dining table for enjoying the indescribable view. 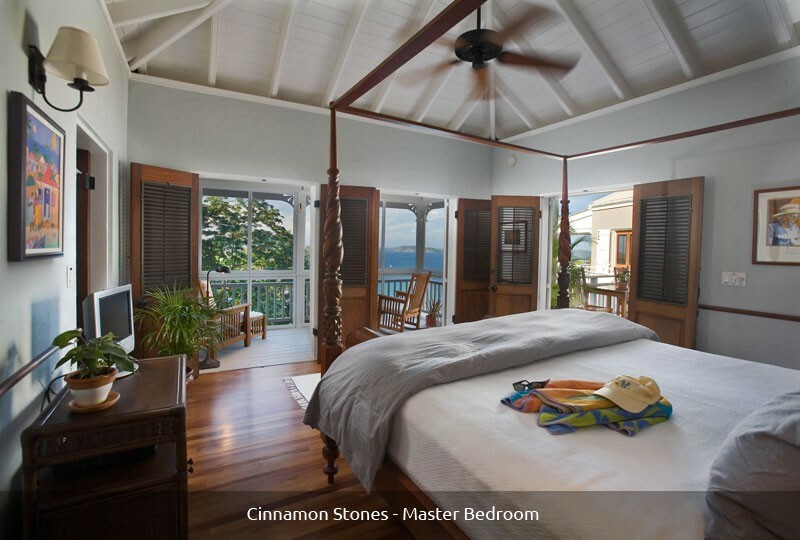 You can sit at the end of the long verandah, in the swinging rope chair facing the rock shelter, the faint remains of stone terraced farming, the tyre palm grove, the bay rum tree and beautiful Cinnamon Beach below. From the kitchen door it is a short walk to the Master Suite across the pergola covered terrace with its fragrant night blooming jasmine. The pale grey walls, white woodwork and mahogany floors and doors create a beautiful space for the St. Croix four poster mahogany bed. The screened porch has a rocker and an armchair. 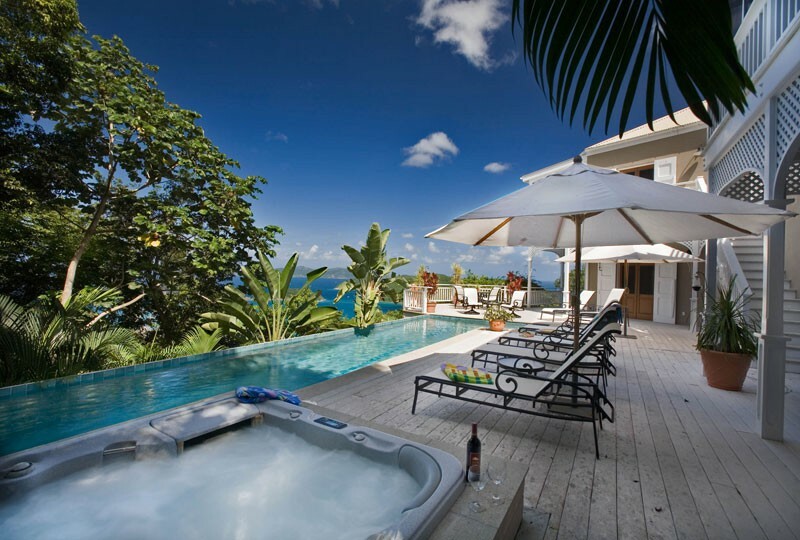 The bathroom has a large screened outdoor shower with a magnificent ocean view. There is a large walk-in closet for all your island attire and a 32” LCD Flat TV with expanded digital cable, Blue Ray DVD player and Echo Dot for your viewing pleasure. From the upper level deck you look down on the 40 X 8 heated lap pool and hot tub. On the lower deck there are two roomy umbrellas that can be moved to shelter you from the sun as you lounge on the steps in the water. All the decks are made of Trex, which has no splinters and is soft on bare feet. 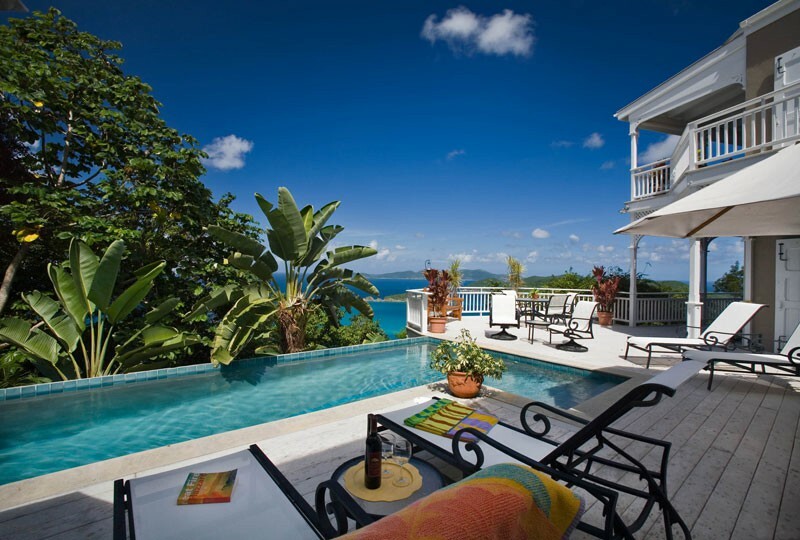 It is roomy around the pool with six lounge chairs along with additional tables and chairs. There is a renovated laundry room off the pool deck with a washer, dryer, ice maker and small refrigerator for cold drinks. 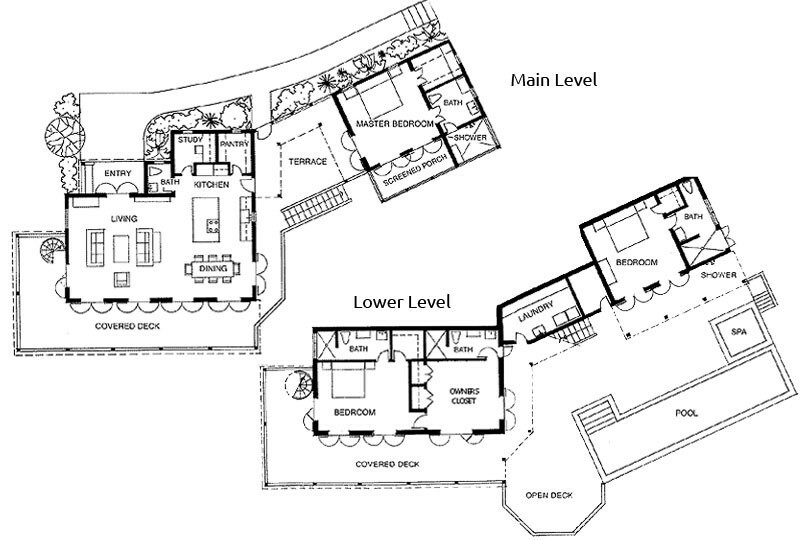 There is also an adjacent full bathroom which opens onto the deck. On the lower level are two large bedrooms each with a unique bathroom and walk-in closet. 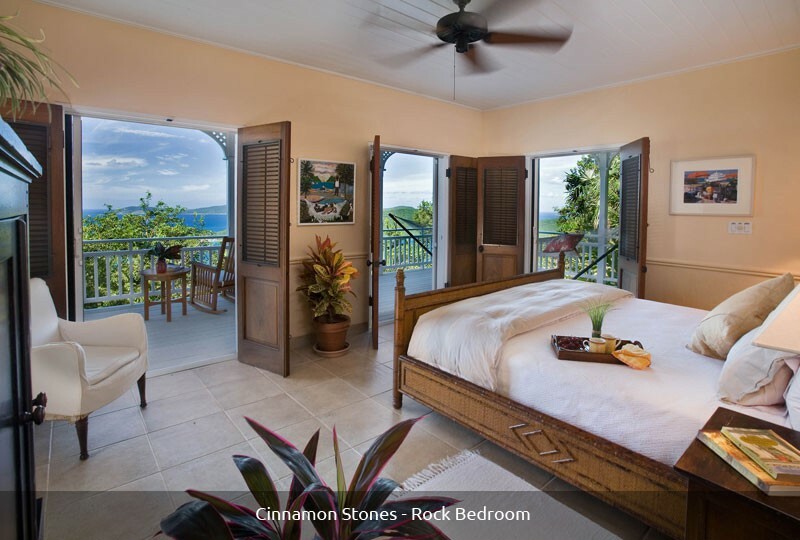 The Rock Suite has a king size bed which is a copy of a plantation bed. On the mahogany table is a 32″ LCD TV with expanded digital cable, Blue Ray DVD player and Echo Dot. The pale peach walls glow as light filters through the mahogany louvered doors. All doors have full sliding screens so that the louvered doors may be left open, if desired. 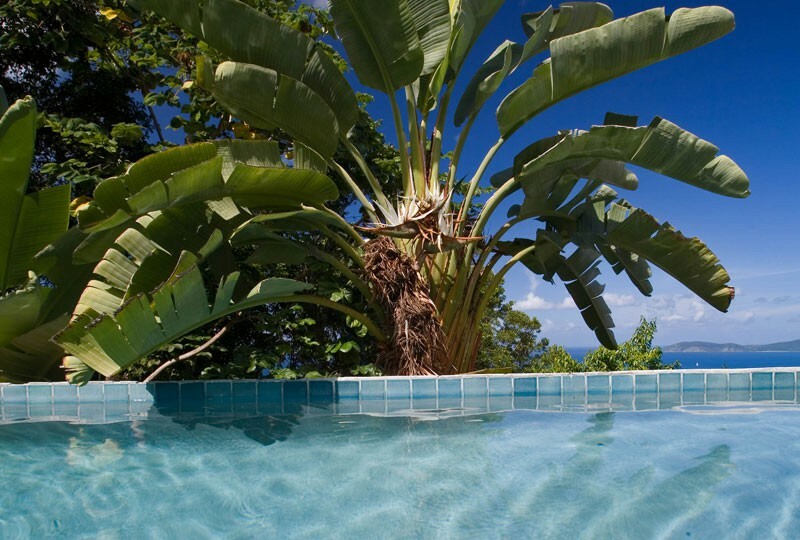 The beautiful lower verandah has more comfortable rockers and arm chairs with a hammock for afternoon naps. 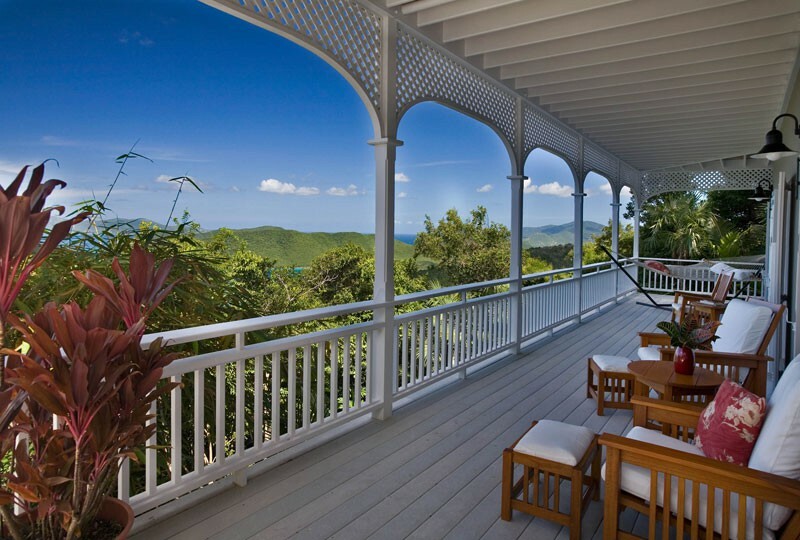 A circular second stairway leads to the Great Room from the end of the verandah. The Pool Suite has a king size four poster mahogany bed. 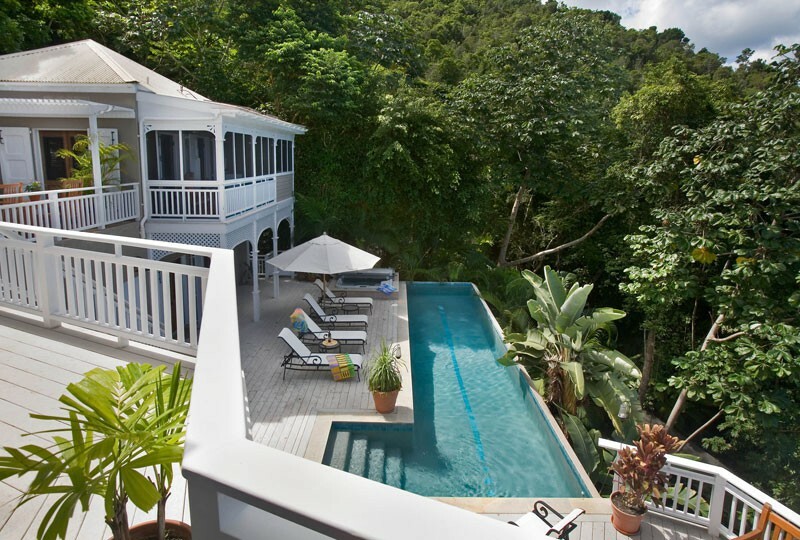 The room is painted soft green to reflect the tropical woods which surround the house. There is a big comfortable wicker chair with footstool perfect for watching a movie on the 32” LCD TV with expanded digital cable, DVD Player and Echo Dot, all located in the large red Chinese armoire. The bathroom is wonderful with a large shower with mahogany louvered doors which open to the hillside garden. 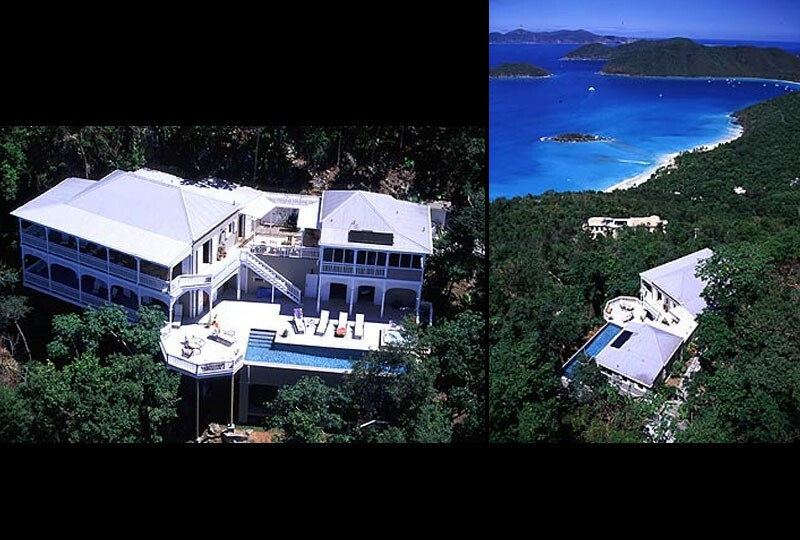 adjacent to the Rock Suite for families with children which can be used instead of the Pool Suite. Please call or email about our children's policy. We now have twin beds available adjacent to the Rock Suite for families with children. Deposit Information: A deposit of 50% of the total rent is required to confirm your reservation. The balance is due 60 days prior to arrival. The deposit is refunded if re-rented, less 20% administrative costs. 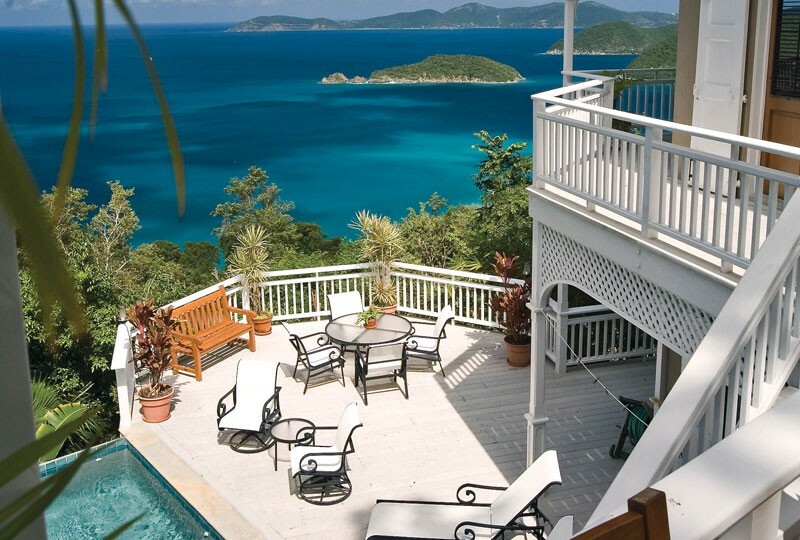 Not included in the rental rates is a Virgin Islands Hotel Tax of 12.5% and a $1000 refundable security deposit.